"Aliens have come to Earth with a business deal: a spaceport on our planet. Now Earth's Security Agents are hunting down a dangerous rogue alien who’s broken loose on the California coast, but one agent’s personal feelings about Earth’s deal with the aliens may push him to defy protocols and threaten the mission." I'm so pleased to bring you a written interview between myself and Andrea Mutti, illustrator of one of my new favorite comics. Andrea is an Italian comic book illustrator, colorist and penciler who has worked on such comics as REBELS, BATMAN, STAR WARS, WOLVERINE and more! If you have not, please check out my video review of issue #1 below this article. Now, onto the interview! FQ: Port of Earth, how did you end up collaborating with Zack on this and how you meet? ANDREA: Hey! I know his stuff but I have received call from TopCow about his new project, SciFi, and..wow, amazing news! I’ll get in touch with Zack by Skype and…love at first look! Very cool guy with lots of cool ideas! My man!! Now I can say that we are real good friends sharing ideas, views and opinion about stuff in real life. This is one of the most amazing things about that job! FQ: This is a really unique story for me but its also very serious for me in that it touches on current events. Was it on purpose that this story sort of reflect the xenophobia happening in the world today? ANDREA: Very good point Amy, really appreciate that you are focused on it..yeh..it's true…the Alien is the stranger…and with the stranger we have the fear of the new, unknown…seems super hard in “our” planet, can you imagine with a contact with several aliens form from outer space?….pretty funny sometimes.We are looking for alien forms in the universe, but we have difficult to interact with the human being that speaks another language or with a different color skin or religion? How does that make sense? FQ: Can u tell me a little bit about how you designed the aliens of the Port of Earth Universe? How many different kinds of aliens will we end up seeing in this series? ANDREA: Oh, in that kind of story, an artist is really free to do what he prefer. This is amazing! We will see lots of different alien forms. So, I had inspiration from some movies, TV shows, books and comics..whatever..BUT, the nature is my first inspiration. FQ: Can you tell me a bit about the character design of our two partners Macintyre and Rice? ANDREA: At the beginning could be the “classic” duo good guy and bad guy. But we will discover much more about those 2 friends. The different reaction about the arrival and about the impact with the society. It's a very big deal. FQ: Could you tell me who or what inspires your work? Is there anything you take inspiration from outside of other artists? ANDREA: Sure thing! I am a hard reader. After 25 years in the comic world, I still remain “simply a reader”. I love read comics and look the other artist. It's the best way for do better an debtor and, of course, for understand that your way is…long again!.There are many artists that I see and follow, it's impossible to make a list, but I thank them overtime if I can! FQ: Out of all the projects you've worked on, which project meant the most to you? ANDREA: For sure my recent serial with Brian Wood REBELS, I love the US history and has been great dig that period…America’s founding, wow!..and, of course, I have to say Batman, my favorite superhero ever! But there is a piece of my heart in everything I do. Conan a great classic, Star Wars…..lots of fun! FQ: Finally, could you tell me a bit about your artistic process and the tools you use? ANDREA: I am an old fashion artist..pencils, inks and all the classic stuff..I love feel the paper’s texture before starting a new project and find the good one for a specific effect….the matter..the matter..is my rule! THANK YOU SO MUCH FOR READING! 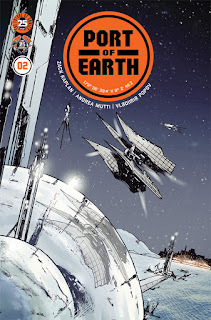 Please check out my review of Port of Earth issue #1 and be sure to add issue #2 to your pull list this month using Diamond ID: OCT170698. Issue 2 will release on December 13th. This is the first time I review a series top to bottom as each issue is released. What more fun than to do it with my current favorite series KID LOBOTOMY by Peter Milligan and Tess Fowler on the new IDW imprint BLACK CROWN. INTERVIEW WITH DAN SLOTT 2017 PT1: Silver Surfer, The End! I'm so pleased to bring you my video interview with Dan Slott where we discuss the closing of his Silver Surfer run with Mike & Laura Allred. I'm still recovering because as you know, this has been my favorite Marvel series for the last few years. All good things come to an end.